Last Sunday, HBO aired the first episode of it’s new series, Bored to Death. This is an HBO original comedy about a young writer who becomes a private detective. An original series requires an original promotion. This is why HBO chose us (again). The USB drive they picked, was our Card Disk Mini Flip model. It was printed with Jonathan Ames’ (main character) information that made the drive look like a business card. 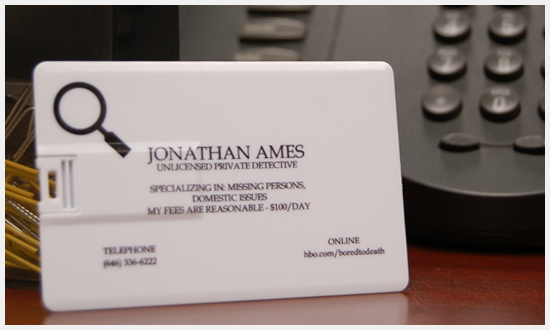 The phone number, (646) 336-6222 rings a voicemail box where Jonathan’s voice talks about this detective services. Try calling it. Each USB drive was pre-loaded with a trailer for the show and a “making of” video. They were giving out at various release parties throughout the US.